U.S. Chamber of Commerce: "Economic Disaster"
...facing economic disaster. We told Betsy Markey we needed jobs. Why didn't she listen? Markey fought for the Obama-Pelosi government takeover of health care, crushing small businesses with billions in penalties. Now Markey wants a national energy tax, costing families nearly $2000 a year. Call Betsy Markey. Tell her to listen. Stop supporting Pelosi and making our economy worse. The U.S. Chamber is responsible for the content of this advertising. 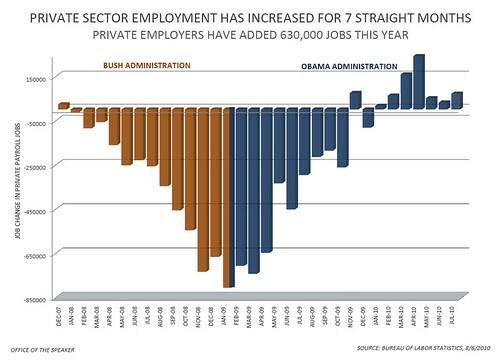 Job Statistics Trend Shows Recovery Act Is Working. Below is a graph prepared by the Speaker's office showing net private sector job gains or losses per month since December 2007.